Spencer: One of the biggest criticisms I’ve seen thrown around about Superman as a character is that he’s “too powerful,” that nothing can challenge a man who can quite literally juggle planets. There’s a bit of truth to this, to be sure, but it’s a narrow criticism, one that only takes into consideration physical challenges; the most interesting Superman stories are the ones that challenge him morally, ethically, or in ways that make his physical abilities useless. Superman 1 is such a story, an issue that finds the character at his most physically competent, yet feeling more lost and helpless than ever before. Brian Michael Bendis and Ivan Reis open the issue with a very welcome recap page (I hope the series continues using the device, and that more DC books follow suit) before hopping directly into the conflict at hand: Lois and Jon are out there somewhere in space, and Superman has no way to contact them, or even to know if they’re okay. Understandably, it leaves him feeling rather out of sorts. It isn’t just the loss of his family that has him feeling aimless — the fact that he has no idea what to do about it is almost just as frustrating, especially for a character so used to always being on top of things. Bendis and Reis pay special attention to that facet of the character; the very next panel finds Superman single-handedly defeating an attempted Dominator invasion of Earth almost inadvertently. The Dominators were the villains of one of DC’s earliest crossover “events,” but to Superman they’re barely a blip on his radar, just another task he can check off his “To-Do” list for the day. This creates a Superman who almost can’t be challenged physically, forcing the audience to pay even more attention to his emotional and moral dilemmas. This is where Superman 1‘s real conflict lies: in the fact that he can’t solve this problem, that it might be better if he didn’t, and that all this worry and indecision stems from Clark’s loneliness. Look how vulnerable Reis makes Superman in the above image — his features feel more round and soft than usual, his face clearly sad and pained. While the Dominators and their invasion force are barely an afterthought, Reis and Bendis devote quite a bit of real estate to Superman’s loneliness, almost luxuriating in it. Reis, inker Joe Prado, and colorist Alex Sinclair create a stark contrast between Clark’s past and present. 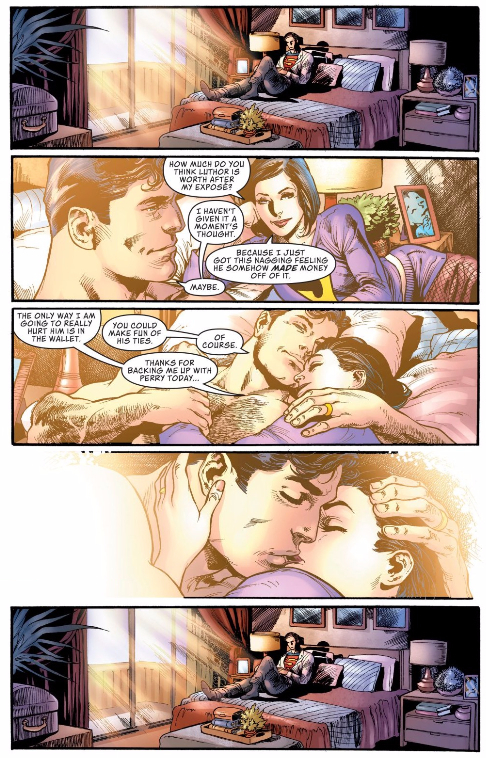 His memories of Lois are so bright they’re practically blinding, at one point so overwhelming the panel that its borders fade away entirely; the “normal” colors of the present look almost drab in comparison, and ominous shadows loom in the corners of those panels, boxing Clark in. Reis frames the flashbacks as close as possible, making for an intense, intimate experience; meanwhile, he pulls as far back as possible in the present, highlighting how much empty space surrounds the motionless Clark. His loneliness is inescapable. Bendis has no answers for this dilemma of Clark’s; all he can provide are more problems. Superman’s conversation with the Martian Manhunter in the skies over the Daily Planet features a contrast similar to the Dominator scene. Superman keeps running off mid-thought to save the day in the way that only he can, but those victories are quick and practically effortless, each contained within a single panel with no thought given or attention paid to how exactly Superman pulled them off or what obstacles he may have faced in the process. They barely warrant a mention at all; instead, Bendis buries the real dilemmas within J’onn’s dialogue. That’s the real conflict — where’s the line between showing the world a better way and forcing a “better way” on them? Can even someone as good as Superman be trusted with that much authority? It’s another question without easy answers, another question Clark can’t punch his way out of, another dilemma he’ll have to grapple with in the coming months. Superman 1 ends with the Earth being mysteriously sucked into the Phantom Zone. On the surface that’s yet another impossible dilemma for Clark, but it’s also one that reintroduces the idea of physical threat in a big way. After all, Rogol Zaar is still trapped within the Zone, and outside of Doomsday himself, Zaar is the Superman villain defined the most by his pure strength, by his being stronger than Clark. I’m not really sure what this means for Superman moving forward. Maybe Zaar will be playing a smaller or different role from here on out, maybe he’s a distraction from the real threat, or maybe Superman’s challenge will be trying to find a new way to neutralize Zaar, since violence was so completely ineffective in the past. Perhaps Bendis just wanted to make sure that Superman was facing a physical challenge as intimidating and insurmountable as the emotional and ethical ones he’s introduced. Regardless, it was a smart decision on Bendis’ behalf to open the series with the more abstract threats first, as it’s made for one of the most complicated, conflicted, and human takes on Clark Kent and Superman that I’ve seen in a long time. I love what Bendis and Reis are doing with Superman in this issue; how about you, Patrick? Patrick: Oh, I couldn’t be happier. 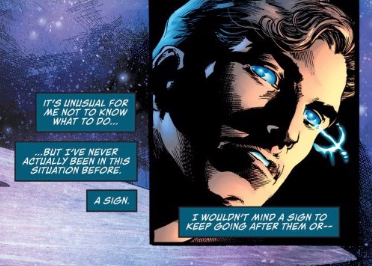 Not only have Bendis and Reis found a way to present Superman with challenges that are genuinely difficult for him, they do it without without sacrificing the human stakes of the character. In fact, those challenges are all a function of his humanity. I want to be clear: Bendis and Reis do not challenge the existence of Clark’s humanity. This is an important distinction. They’re never going to put Superman in the position where he has to choose between stopping a bus full of orphans from careening off a cliff and saving Lois’ life. That’s the kind of moral and ethical dilemma which sounds deep in the abstract, but can only play out like a philosophy lecture. Y’know: measuring the “greater good” in number of lives saved. “Lives saved” is the baseline assumption for this version of Superman. The choice that J’onn presents in his pitch for a better world would improve the quality of those lives saved. J’onn’s making a political statement here: it’s not enough to simply ensure survival when the power they possess can provide so much more. Put short: survival isn’t everything. That’s the crux of Superman’s character under the pen of Brian Michael Bendis. Sure, physical obstacles are never going to kill Superman — so what? Does that mean he can’t have goals? Can’t struggle? Can’t want something more? I am fascinated by the fact that this leads to a very funny issue of Superman. 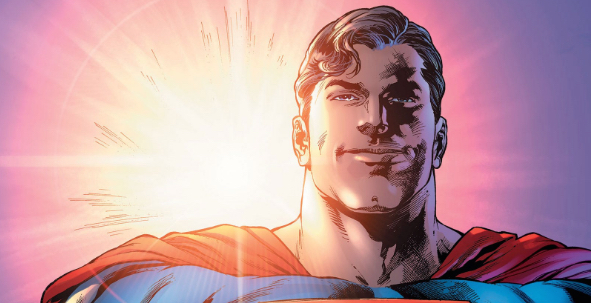 We’ve written a lot about the unique brand of humor Tom King demonstrates in Batman, which is a mix of campiness and gritty reality and mundanity, and if this issue is any indication, Superman has an equally specific sense of humor. Where Batman will revel in the ridiculousness of small moments, Superman will revel in the ridiculousness of the enormous moments. Take the formation of the new Fortress of Solitude, for example. 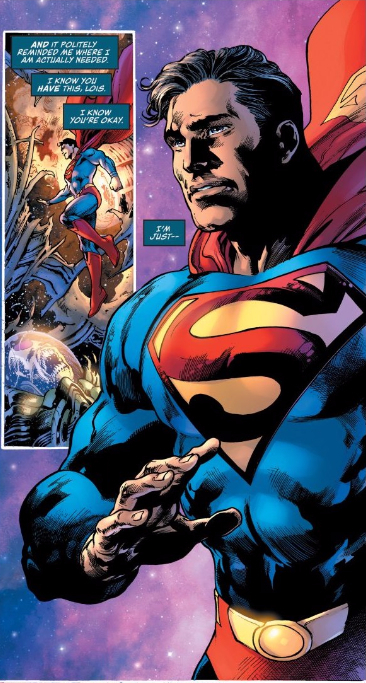 Reis draws these impossibly tall, narrow panels, emphasizing the downward trajectory of Kryptonian crystal, almost like Supes is spiking the ball after crossing into the end zone. The setting chyrons get in on this game too. “The Bermuda Triangle.” Each word is in its own panel, there’s a panel of pause between each one, and it ends with a definitive period. 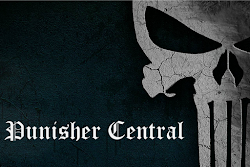 It’s a prestige moment, and you can practically hear Bendis’ reedy tenor barking his excitement. The Bermuda Triangle is the perfect punchline to the joke that was set up on the previous page. The other heroes are suggesting new locations for the Fortress, but all of their suggestions (New York, Portland, the Moon) lack the kind of bonkers creativity of the Bermuda Triangle. But not all of Superman‘s jokes have to play on this enormous scale. Just like the conflict of the issue, some of the most successful beats of humor play out on extremely personal levels. Even this moment about the Fortress of Solitude pivots to a little joke about the relationship between Clark’s articles about Superman and the table-setting narration in Superman comics. The text first appears on the page without justification: “Superman has a new Fortress of Solitude.” The tone recalls the same recap text Spencer was praising above, and the reader isn’t meant to think that this is something other than that helpfully omniscient voice filling in the details of the universe. But we zoom out to discover that it’s just Clark writing high falutin prose about himself. It’s weird. But the best part is that he recognizes it as weird, mutters “ego”, and then holds down the delete key until he’s done embarrassing himself. “This one had fire” followed by the two characters stammering at each other. This is the heart of what makes this issue, and this character, so good. Superman is in tune with the wants and needs and fears of the people in his life, so the team can deliver on a subtle character gag like this. It’s funny because they know each other and we know them. That’s the breadth of humor because that’s the breadth of subject in this thing. “How will Superman overcome his loneliness?” is held in equal measure as “Will Superman lead the Earth to a new technologically enriched future beyond their wildest dreams?” It is a confident, acrobatic mastery of everything Superman can and should be. I think this is the best art of Reis’ career, hands-down. I’m astounded by his work in this issue. Bravo. The one thing that did bug me was Jon Kent’s complaining about going to school. Has Bendis read Super Sons? Jon LOVES school, that little nerd. He likes learning and he likes pretending to be human there and he likes seeing Damian there and he likes rubbing how good he is at it all in Damian’s face. I like the flashback of Clark and Jon, but that one little detail didn’t ring true to me. Maybe that was pre-Damian? Before Jon learned to have fun in school and just wanted to hang out at home with mom and dad? Will give Bendis’ Superman a try – have ordered Man of Steel issues but haven’t read them yet. As an aside, it’s nice to see Martian Manhunter brought back into the fold. Feel like he kind of got the shaft with New 52. MM’s appearance here is very much in line with Snyder’s approach to him in his current Justice League run. If you like him here, it might be worth checking JL out, too! This issue was so close to working for me, and then it had J’on J’onz, the Martian Manhunter, the “heart and soul of the Justice League” advocating for the take over of the earth. And, since the art kept framing him in a suspicious light, I have expected it to be revealed that this was J’on but someone impersonating him. It just felt so bizarrely out of character for him to be going full on “Injustice” on Superman. I feel the same way. I literally had to go back and reread the entire scene to make sure I didn’t misunderstand what J’on was saying. 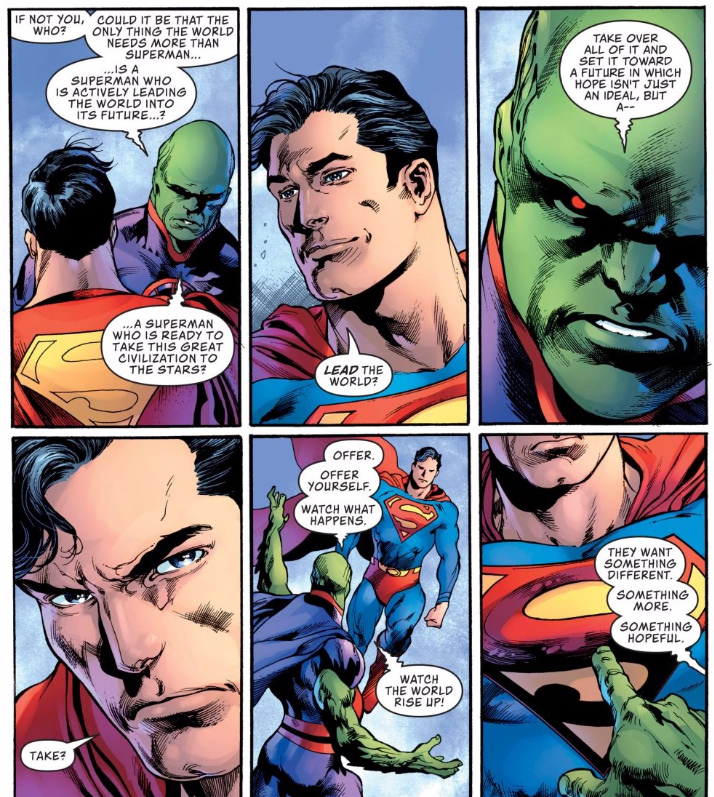 I was very, very surprised by that (although I’m not a big Martian Manhunter reader, so maybe he’s always a little, “Hey, just rule the whole thing, bro. You got it.” I wouldn’t know).